FLORHAM PARK, NEW JERSEY, FEBRUARY 28, 2019 – Congratulations to Alex Bliziotis, who recently accepted an offer to become Sino Lion’s Junior Account Manager. Alex comes to Sino Lion from Jarchem Industries, where he spent 2 years as Technical Sales Representative. He graduated from The University of Delaware with his Bachelor’s degree in Chemical Engineering with a minor in Biochemical Engineering, Economics. While at the University of Delaware, Alex was also involved in several activities and societies including: Tau Beta Pi Engineering Honor Society, Deltones Acapella Group and Swim Club. Being both a chemical engineer and a musician/creative has allowed him to approach projects with a different perspective, offering a fresh take to drive innovation. Sino Lion USA is a rapidly growing global supplier of specialty cosmetics ingredients. They are a global leader for green, natural and sustainable ingredients and technologically advanced raw materials for the cosmetic and personal care industry. Sino Lion provides 4 main pillars of cutting-edge technology product families: Surfactants, Preservatives, Sun Care and Polymers. Additionally, they offer various unique specialty chemicals including skin care emollients, sensory agents, emulsifiers, skin lightening agents, anti-aging actives and moisturizers. WEST CHICAGO, ILLINOIS, FEBRUARY 27, 2019 – Congratulations to Neal Rogers, who recently accepted an offer to become VINAVIL’s Business Development Manager. Neal is an accomplished coatings resin scientist with a complementary combination of technical service, market analysis and sales experience. This allows him to leverage marketing and customer communication skills in a Sales Account Manager role. He comes to VINAVIL from Arkema Coating Resins where he spent 7 years as their Technical Account Coordinator. Neal graduated from the University of Illinois with his Bachelor’s degree in Chemical Engineering and received his Master’s in Marketing from the University of California – Marshall School of Business. VINAVIL has more than 60 years of experience in polymer science and service to the chemical industry. Their core strategy encompasses a focus growth on innovation, to improve existing products and to develop new products for the coatings, adhesives, textiles, building industries and more. VINAVIL’s strength lies in the combination of highly-qualified R&D teams and an effective, empowered commercial department, working together to fulfill customers’ needs and achieve their satisfaction. DALTON, GEORIGIA, FEBRUARY 21, 2019 – Congratulations to Bob Baden, who has recently accepted an offer to become Southern Chemical & Textile’s new Vice President of Operations. Bob comes to Southern Chemical & Textile from Oxiteno, where he spent 5 years as Director of Plant Operations. Prior to Oxiteno, Bob was a Plant Manager at Clariant for 12 years. He earned his Bachelor's of Science in Chemistry from Montana State University. Southern Chemical & Textile is a specialty chemical company and was established from an innovation philosophy of combining science and consumer focus to yield next level products. They have been at the forefront of the sustainable manufacturing movement since 1984 and utilize raw materials from only trusted and verified sources that meet or exceed their sustainable sourcing requirements. HOUSTON, TEXAS, FEBURARY 20, 2019 – Congratulations to Yoganand Ramamurthy, who recently accepted an offer to become Alizent’s Business Unit Director and Country Manager. Yoganand comes to Alizent from Tata Consultancy Services, where he spent 15 years working his way up to his most recent position of Business Relationship Manager. At Tata, he was responsible for 3 key engineering markets – Oil & Gas, Distributed Power Generation and Transmission & Distribution. He provided exceptional service to clients throughout the sales cycle; by performing needs analyses, addressing technical concerns and maximizing business opportunities for TCS. Yoganand’s responsibilities also included covering all aspects and services within the Integrated Engineering & Information Technology stream for new product development, from concept design, to validation. Yoganand graduated from PSG College of Technology, where he received his Bachelor’s degree in Electrical & Electronics. Alizent is a fully owned subsidiary of Air Liquide Group who specializes in developing Digital Solutions to connect & leverage Industrial and Medical Assets, using technologies such as RFID, IoT, SCADA, MES and data analytics. For over 20 years, Alizent has been committed to delivering innovative technological solutions to the Industrial sector. Their solutions help transform businesses, improving the efficiency of operations and establishing new communication channels with customers and partners. WEST CALDWELL, NEW JERSEY, JANUARY 30, 2019 – Congratulations to Catherine Roth, who recently accepted an offer to become Vitaquest’s Vice President of Procurement. Catherine comes to Vitaquest from Revlon, where she spent 20 years working her way up to her most recent position of Director, Global Master Data. She earned her Bachelor’s degree in Environmental Human Ecology from Rutgers University. Vitaquest has been providing quality vitamin and supplement manufacturing to their clients for more than 40 years, with a focus on nutraceuticals. They handle every aspect of GMP manufacturing for their products and pride themselves on their dedication to offering clients the highest level of customer care, quality, experience, innovation, sustainability and social responsibility. 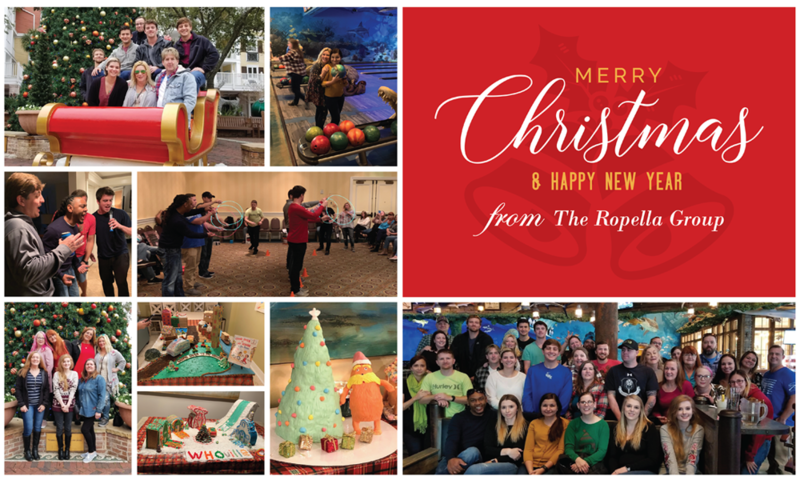 Last weekend the Ropella Group gathered for their annual Christmas party in Destin, Florida. We began our event-filled weekend on Friday afternoon, meeting at Uncle Buck’s bowling alley just outside the beautiful Destin Commons. Here we were able to partake in snacks and a fun but competitive game of bowling. After walking around the Commons with spending cash in our pockets, it was on to dinner at Osaka Japanese Hibachi Steakhouse & Sushi. After dinner, we then made our way to Baytowne Wharf to check in at Lasata and prepare for our company gift exchange. There were gifts of all shapes and sizes such as tool boxes, gift cards, fuzzy blankets, Echo dots, and even a machete! If you know the Ropella Group, you know that the fun did not stop there. Oh no, we ended the first night of the Ropella gathering in CEO Patrick Ropella’s room for a lively game of Catch Phrase and some karaoke. The next morning, Another Broken Egg was where we all met for a wonderful breakfast and a much-needed cup of coffee. Afterwards, the group parted ways and headed to one of three pre-planned activities of their choice, Laser-tag, mini-golf or wine tasting. Earlier in the afternoon, everyone had been prompted to be back in their rooms at Lasata for the most important event of the weekend, The Gingerbread House Contest. The Ropella Group had been challenged several weeks earlier to come up with a creative, Dr. Seuss-themed display. Even though we all have competitive spirits and enjoy games and contests, the most important takeaway from the weekend of togetherness was to form a closer bond with our Ropella family. I believe that we achieved this goal as evidenced in the picture compilation below. Thank you, Pat and Robbie, for the great weekend. MARION, NORTH CAROLINA, DECEMBER 12, 2018 – The Ropella Group, the leading Executive Search firm specializing in the chemical, consumer products and technology industries, has launched two new searches on behalf of Coats – North America, who is looking for a Research & Development Engineer and a Product Development Research Scientist to support the company in the growth and development of high-performance products to solve customers’ needs. Coats is the world’s leading industrial thread manufacturer and a major player in the Americas textiles and craft market. Coats products are part of the fabric of everyday life: from clothing, accessories and furniture to fiber optics. The company aims to deliver innovation, digital solutions and sustainable value to all stakeholders. In October 2018, Coats opened its first Innovation Hub in Marion, North Carolina. This hub will serve as one of three centers around the world used for collaboration with a range of partners including customers, suppliers, universities and start-ups. The Innovation Hubs will develop pioneering new products and processes in apparel, footwear and performance materials, which encompasses hi-tech products for end uses in automotive, oil and gas, protective wear and telecom. The Research & Development Engineer and the Product Development Research Scientist will be responsible for the development of new products and associated processes with a primary focus on technologies that are new to Coats. Research & Development Engineer – This role will be working in the Coats Innovation Hub – America and reporting to the Innovation Director. The R&D Engineer will be an integral team member in the growth and innovation efforts of the North American Cluster. They will be responsible for the development of new products and associated processes or modification of existing products in the Performance Materials and Apparel & Footwear portfolio to meet market and specific customer needs. They will also be responsible for analyzing samples and determining construction and yarn content and translating information into product specifications. Coats is looking for qualified individuals with 3 to 5 years of relevant work experience, as well a Master’s degree in Material Science or a related field. They will need to demonstrate familiarity with state-of-the-art technologies in textile engineering and manufacturing, yarns and common post-production techniques, such as dyeing and finishing. The R&D Engineer must be able to inform and drive prototype creation on lab-scale / pilot machines in the Innovation Hub, as well as being a highly motivated, self-driven and open-minded individual who is capable of accomplishing tasks and projects in a limited supervision environment. Product Development Research Scientist – This role will be working in the Coats Innovation Hub – Americas and reporting to the Innovation Director. The Product Development Research Scientist will be an integral team member in the growth and innovation efforts of the North American Cluster. They will be responsible for assisting the Sales team with the review and development of new products including solutions to previously untapped areas, as well as liaising with Manufacturing and Sales/Marketing personnel to ensure that product and process developments progress to successful commercial practice. Coats is looking for qualified individuals with a Bachelor’s degree in Polymer Science, Material Science, Textile Chemistry or a related field. They will need to demonstrate direct, hands-on experience developing innovative solutions for industry applications using polymer chemistry and surface science. The Product Development Research Scientist must also have experience leading new product development projects of engineered yarns and fabrics, using textile fibers and coatings.